In His Majesty's Scholarly Service: Chag Sameach!! WOW, it's been a while, huh? What happens that keeps me from blogging for all these many weeks? Hard to say, sort of - the term went from business-as-usual to lightning-fast without me even noticing, and now it's suddenly the middle of April and spring is very much upon us here. The sun shines, the birds sing (they actually do; opening the windows in class can be a dangerous move), and I'm here trying to quiet down these whiny delinquents so I can write this post in peace. So I think the reason things have gone so fast is that I haven't had a five-day week of school in a little while. The first weekend in April was utterly eaten by my return to New Haven for the Spizzwinks'(?) 100th Reunion, an event so momentous that I had explicitly mentioned it to the higher-ups before signing my contract. (They were, fortunately, perfectly fine with the idea, though it probably helped that I called it a "music conference"). And what a weekend! My first flight home was canceled, which led to a nerve-wracking few hours before I was rerouted through Rome and (thanks to two Moroccan cabbies in New York and New Haven who were reasonably impressed with my Arabic skills) made it in time for almost all of the celebrating. It was all the singing, carousing, and reminiscing that I ever could've hoped for, and I didn't even feel the jetlag when I returned! Plenty of videos are on their way; here's a fun one from our gala dinner at the Omni. I miss everyone already. What an amazingly fortunate thing to be a part of for the rest of my life. One thing that made me so glad that weekend was the realization that here, in Jordan, is probably the furthest away from my singing friends that I'll ever be, and thinking about everything we have left to look forward to made it a little easier to hop back on the plane. Austrian Airlines was showing Frozen, too, which helped. So then this past weekend, after a whiz-bang blink-and-you-miss-it three days of school that I can barely remember, we welcomed a trio of Austrians to campus for a few days of music workshops (why the confluence of Austrians? No clue). This had been in the works for a few months and finally came to pass, and I must admit that I was feeling a little underprepared when the action started. Why? Well, partly my fault - I had taken no responsibility but had sort of played along, and didn't realize until the weekend was nearly upon us that the Glee Club was supposed to be present at six 2+-hour rehearsals over the course of the weekend. This is an awful lot to ask of a choir that usually meets once a week for an hour and doesn't really read music, and I had been wary of forcing them to come because I had no idea what the event was going to entail. I also hadn't really been informed of what was going on...you get the picture. It was touch-and-go, to say the least. BUT! The kids, awesome and amazing and curious people that they are, pulled through - by the final performance, which included the quite wonderful Dozan wa Awtar community choir from Amman, we had the 15-20 students I had promised mixed right in with the rest of the singers. It was tough music, too: Bruckner's Locus Iste (shout-out to the Yale Glee Club! ), Mozart's Ave Verum Corpus, a somewhat tonal composition by one of the Austrians herself, and a totally bizarre piece from the 30s that had all of us basically barking random notes at random times. For students who have never sung in a tenor clef before, much less in 4-part Latin or atonal improvisation, this was quite an undertaking, but the kids jumped right in and I think they took an awful lot out of the weekend. They weren't the only ones, either: Ewald Donhoffer, our director, was an utterly inspiring figure whose rehearsal style won over the students and the adults from Dozan alike. I found myself sneaking to the back of the group to take notes on my phone about all of his warmups, exercises, and fantastically creative imagery - I learned so much in those few days that I've gotten seriously pumped about the Choral Conducting Workshop I'll be attending in Michigan this June. So all in all, what looked like an utter shitshow ended up being something of a success, not to mention a serious learning experience about wrangling students and structuring weekend workshops. I really hope they come back, for my sake if no one else's! 3. Passover: This Week in Jerusalem!! And so, somehow or another, we've reached the present. If this post is going to have a theme, it's something about memory and time and the transience of experience, and what better way to bring all of those themes together than a big ol' Jewish holiday? 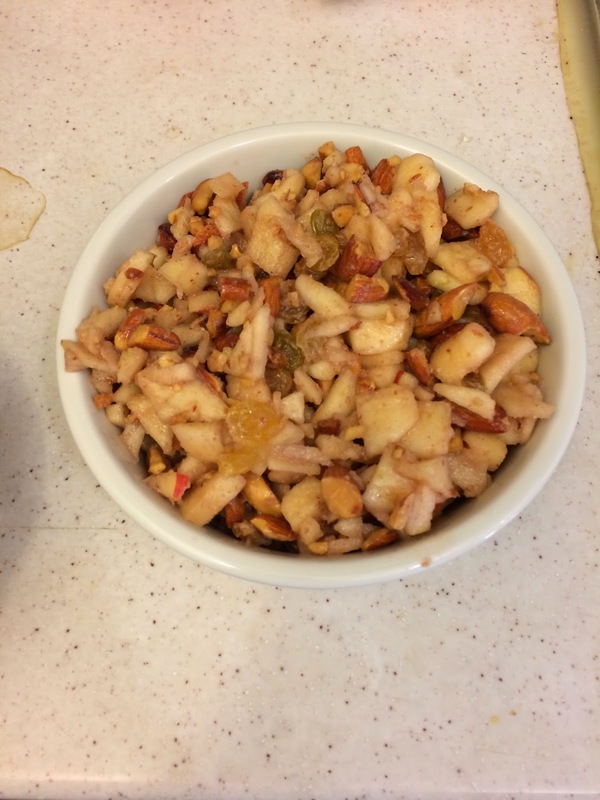 Charoset without a food processor. Certainly on the chunky side, but we hit the right flavor points (and the charoset virgins seemed pleased). Ready to start! Those papers on the plates are the two-page Haggadot that I threw together and printed out to serve as guides; we also had a real Haggadah to give a little more meat to the service. Speaking of meat, that plastic bag to Yasmine's right is our shankbone, which was quite literally the entire leg of whatever animal they were butchering when we got to the Carrefour butcher. We said it was for our dog. 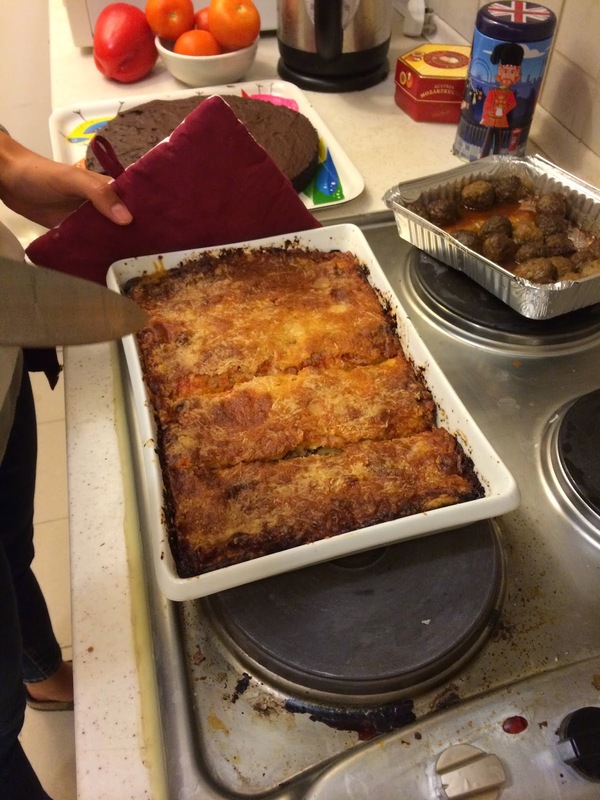 The main course: matzah lasagna with roasted eggplant, courtesy of me and Yasmine. This recipe's a keeper (and we only had to combine like 4 assorted lasagna recipes to execute it!). 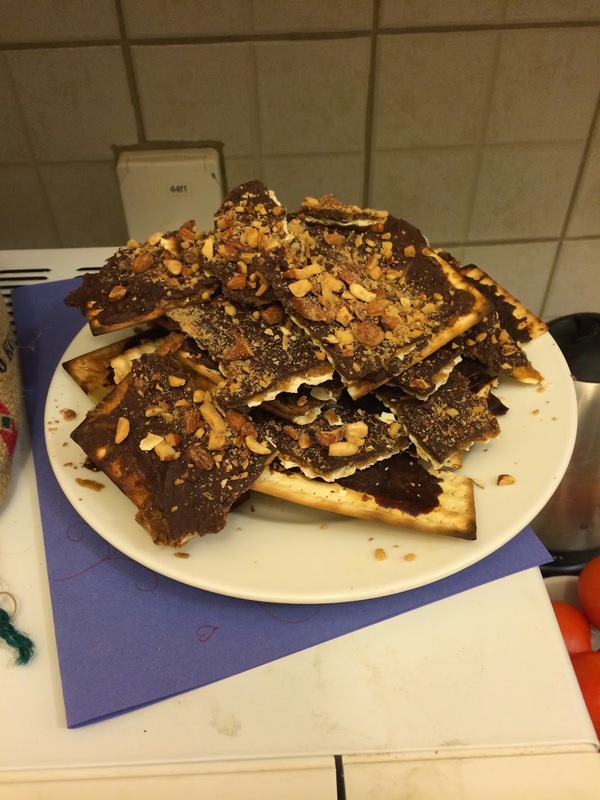 The obvious pièce de résistance: matzah candy/matzah toffee/matzah crack. Our first batch of caramel burnt, which didn't make the resulting toffee any less delicious (kinda smoky! ), and the second batch was utterly perfect so we graced it with salted almonds to really knock everyone's socks off. I literally could not stop eating it. There's a lot left. And I think I might use the leftover matzah (of which there's plenty; thanks Mom and Dad!) to make more. 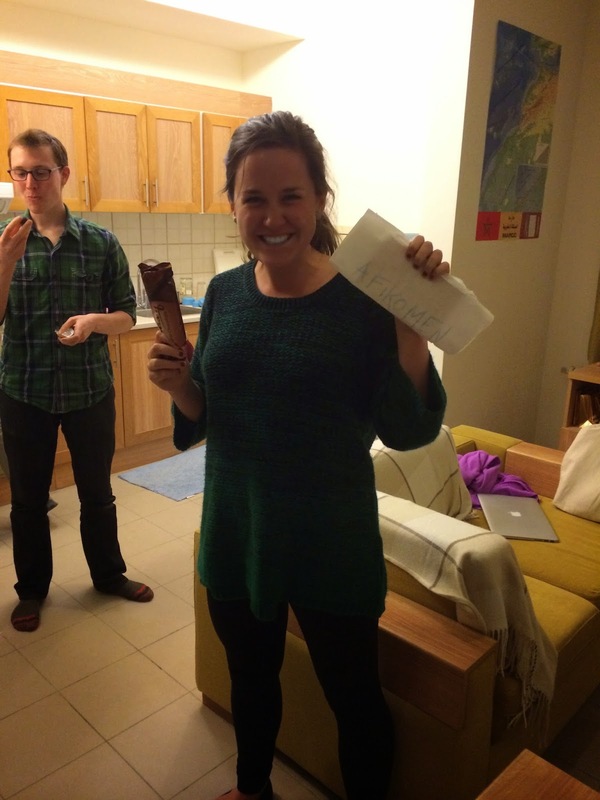 Meg finds the afikomen! The prize: more dessert! I hid it inside the Haggadah itself because I didn't have time to do anything else. Dad, I have no idea how you manage to pull off the hiding job every year - Chase and Meg were vigilant and it was amazing the search even lasted the three minutes that it did. Leading a Seder is, somewhat unsurprisingly, a lot like teaching a class, and it feels even more so on the other side. As with all the lessons I teach for the first time, this one has plenty of room for improvement, but overall I think people learned and we had some nice little discussions, which (as far as I'm concerned) is really what the holiday is about. Every slurp of salt water from a piece of parsley and every refrain of Dayenu felt like a little piece of home, and I ended the night by whistling "Eliyahu HaNavi" into the darkness on my walk back from Yasmine's. Chag sameach, indeed. Well, the "this week in Jerusalem" part wasn't a lie: Daniel and I are staying at a yeshiva for Easter weekend! We've got 4 days off, and what better way to spend our Passover than in the center of it all. With the Holy Land a stone's throw away (almost literally), it felt like the obvious choice, and I'm excited to see what a few days of serious Torah study with some seriously observant Jews will feel like. And then? A three-day week next week punctuated by a big concert for which the Glee Club is more-or-less ready, and then a four-day week the week after that, and all of a sudden it's May and we're really nearing the end of things. As I suspected, the end is feeling like a crazy cascade towards the finish line, and I'm doing my best to appreciate the many things there are to love about King's rather than cross off the days until I return home. Classes are going well; I'm playing around with the structure of our units because I feel comfortable enough with the material to do that, and it's been nice to get out of the last two terms' comfort zone (especially with these particular classes of kids, which are real gems in wonderfully different ways). I promise to update more frequently in the weeks to come, which the schedule should allow - stay tuned for more as the weather heats up and the end of my first year as a professional teacher approaches!